Powers/Abilities: Agile and athletic, but his main power is his keen scientific knowledge. His Buzz Gun is intended purely for show, to scare criminals, and doesn't actually anything much. He flies around in a beetle shaped aircraft "Bug" which is capable of being left hovering when he needs to swing into action. History: At the request of Ted Kord, Dan Garrett, the original Blue Beetle, travels to Pago Island. There in a laboratory, Ted's Uncle Jarvis has created an army of killer robots with which he plans to conquer the world. Dan Garrett transforms into the Blue Beetle and goes after the robots. But Uncle Jarvis has one more card up his sleeve. He can channel huge amounts of electricity through the robots, thus killing the Blue Beetle and himself. With his dying breath, Blue Beetle asks Ted Kord to take the scarab and become the Blue Beetle. But the cave collapses, forcing Ted to flee before he can claim the mystical device. Thus he designs his own version of the Blue Beetle, as he does not have the scarab. Comments: Thanks to Dalenetrudy for information on this incarnation of the Blue Beetle's origin. 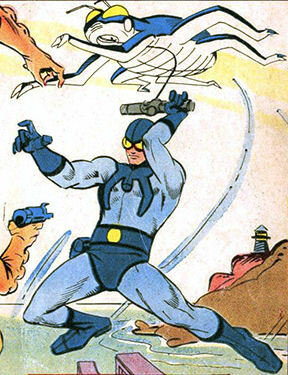 Blue Beetle served as the inspiration for Nite Owl in Alan Moore's Watchmen. Thanks to Tom Wright for additional information.